What to cook? It’s Sunday evening, I don’t feel like creating a masterpiece, but need to make something that’s tasty and not just a toasted sandwich. I have chicken thighs (surprise! ), some left-over potatoes and fresh lettuce and rocket from the garden. 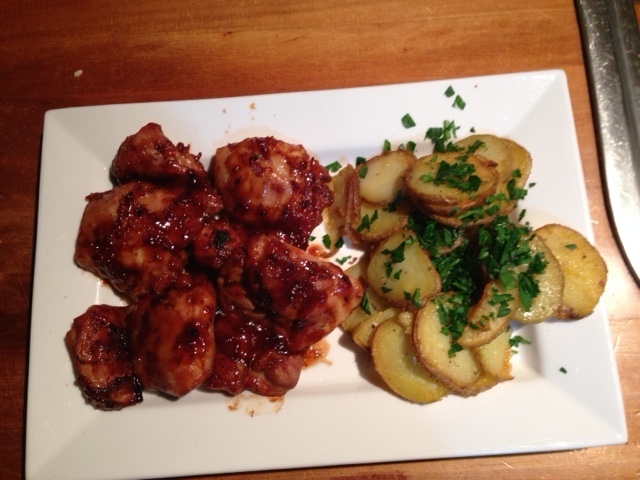 After a quick google and found this (http://www.bite.co.nz/recipe/3527/Sticky-soy-chicken-wings/) decide to cook sticky soy chicken thighs and slice off and reheat the hasselback potatoes from last night. Combine ingredients and pour over chicken. Toss well. Cover and refrigerate to marinate for 30 minutes. Heat oven to 200 deg C. Remember that ovens differ, so your oven may require slightly higher, though probably not lower. Place chicken in a single layer in an oven pan. Spoon over some marinade, and continue to spoon over about every 15 minutes. Cook for about 40 minutes. Because my chicken was skin off, I put the chicken under a hot grill for the last 5 minutes to brown up. Spoon over the last of the marinade before you do this. Last night we had Hasselback potatoes and had some left over. I sliced them, heated some olive oil in a pan, and slowly cooked them until crispy. Hmmmhmmm, almost just as good as last night. The addition of a green salad, with cos and rocket from the garden, with red pepper and tomatoes was the bomb.